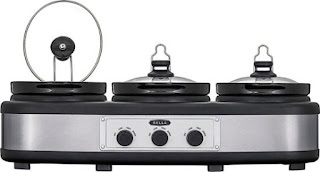 Today only, while supplies last, score this Bella - 3 x 2.5-Quart Triple Slow Cooker for ONLY $29.99 (Retail $59.99). Cook for the whole family with this triple slow cooker, featuring individual temperature controls for multiple dishes and serving spoons with individual rests. Dishwasher-safe stoneware pots make cleanup easy.